Some consultants love to travel for their consulting projects. Me, I’m not a big fan. I prefer to be with my family, sleep in my own bed, eat healthy, home-cooked meals, and work in my gym clothes. Besides, when I’m on the road, there’s less time for marketing and business development, and I can’t play old-man hockey at the local rink. But how do you build a booming, lucrative consulting practice while staying cozily ensconced in your home office? On a typical, six-figure project I will spend roughly four or five days on the road; perhaps six if the client is on the West Coast or in Europe (because of travel time). It’s not unusual for me to win and deliver a project without ever stepping foot outside my office. When you limit travel as I’ve done, your time investment in each project is far lower, and your day rate (if you track that metric) is generally four-to-six times higher than if you’re a traveling consultant. Multiply your revenue by four and see what that does for your income. Is there an advantage to being at your client’s site? Absolutely. You can walk the halls, form new relationships, strengthen existing bonds, tee-up additional projects, and solve (some) problems more quickly. Most of those benefits can be accrued in a day or two while you’re conducting essential, onsite tasks. Observing the client’s equipment, or setup, or employees in situ (e.g., shadowing employees) . Work sessions. Few projects have more than three in-person work-sessions. Those first three tasks can all be accomplished in a single day or perhaps two. A findings review and a work-session or two may comprise another onsite day. Add a day for training, a day for the final presentation and even if you add a full day for travel time, you’ve delivered a significant project with only one week away from your office. What about everything else—the other work you’re tackling when you’re at client locations? Most likely you can accomplish it better and more efficiently at home. Why are you really spending time at client locations? Is it your need to socialize? Go out with friends at home or create a local, in-person mastermind group. Is it your desire to be in front of people, leading them? Take on more speaking gigs. Is it your sense that the client requires you to be onsite? Challenge that belief. Most clients actually don’t want consultants in their offices, disrupting their people and routines. Clients that do expect significant face time often have controlling personalities or are confusing activity with results. Remind them that your responsibility is to deliver results, not activity, and that you are a peer, not an employee. 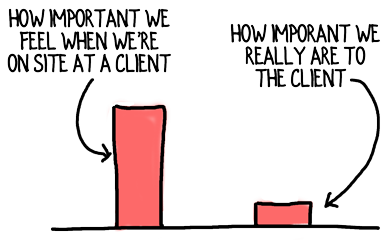 If you couldn’t be at the client, how would you deliver the project? Meetings can be conducted via phone or video conferences. 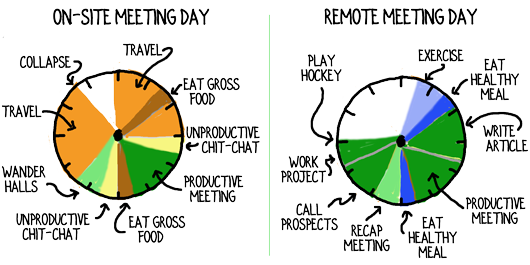 Do some meetings benefit from in-person interaction? Yes. Is that benefit worth all the extra time required for you and the other attendees? Rarely. Spend one hour organizing a more efficient, productive meeting and you’ll far outstrip the usefulness of the typical, in-person powwow. Training and coaching are often more effective when they’re delivered on-the-fly, as needed remotely. Cut your travel time in half on your next consulting project and see whether you’re able to delight your client. I bet you both end up happier. What are you doing (or could you do going forward) to minimize your travel time? Please share your thoughts below, in the comments section. Very interesting perspective. Unfortunately, one of my frustrations is that I often encounter companies/potential clients who are not interested in a remote arrangement at all. I am actually dealing with two separate issues. One is that the potential client is not looking for a consultant but rather is only interested in a full time employee even though they do not appear to have a full time workload and they are only interested in people who can work on site. The other issue is where I am working with a consulting company and the consulting company is insisting that we be on site to demonstrate to the client that we are actively working on their project. It seems to me that meeting deliverables in a timely manner would be a better indication that you are active on the project but in this case they are looking to put on a good show. I realize that neither of these fully align with the role of the solo consultant. Unfortunately it is the circumstances that I am in at the moment as my work at larger clients has slowed substantially. I need to find a better way to promote the value proposition that I provide. Thanks for all of these articles that you write. They are quite helpful and very interesting. Kenneth, your situation is not unusual. Thank you for being willing to share your frustrations. In both cases you are taking on Bread & Butter work–lower level, lower margin work that keeps he lights on. There’s nothing wrong with Bread & Butter work–in fact, I encourage it…up to a point. Never let Bread & Butter work consume more than 50% of your capacity. Your first client isn’t looking for consulting, they’re looking for an outsourced employee. As a result, their expectation is that the resource look like an employee; i.e., onsite. I could give you all sorts of language to challenge the client’s expectations, but from your description it sounds like they’re set in their requirements. Net: Deal with the travel and be thankful you have some Bread & Butter work, BUT, don’t let that work take more than 50% of your time. Use the remaining time to win more lucrative, stay-at-home consulting projects. I like your Middle Way. Too much travel erodes the bottom line. Too little contact with clients can impair successful execution of the program. Balance is the key. For me, meeting with a client at the beginning of a project is the most important time. A single good kick-off visit can build enough bonds to help keep the relationship productive when the work really ramps up. After that first visit, marginal benefits of on-site decline. The trick for me is determining if a client is serious enough at the beginning to warrant on-site travel. If the client is not serious or lets the project die a slow death, that extra travel time goes back to eroding the bottom line. 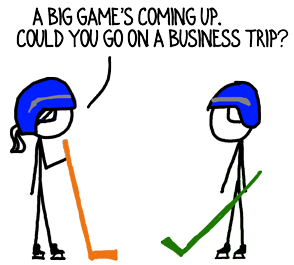 If they do become a serious client, the travel time is a great investment. Peter, you’ve point out an assumption in my article: that we’re dealing with substantial ($75k+) projects. I typically don’t travel at all for very small projects unless there’s a one-day training or something like that built in. You’re quite right that balance is important. If we sequester ourselves in our offices, business will eventually dry up. If we’re constantly on the road we become honorary pilots. Also, I totally agree that travel should often be viewed as an investment in the business–and one that typically pays of handsomely if it’s managed well.